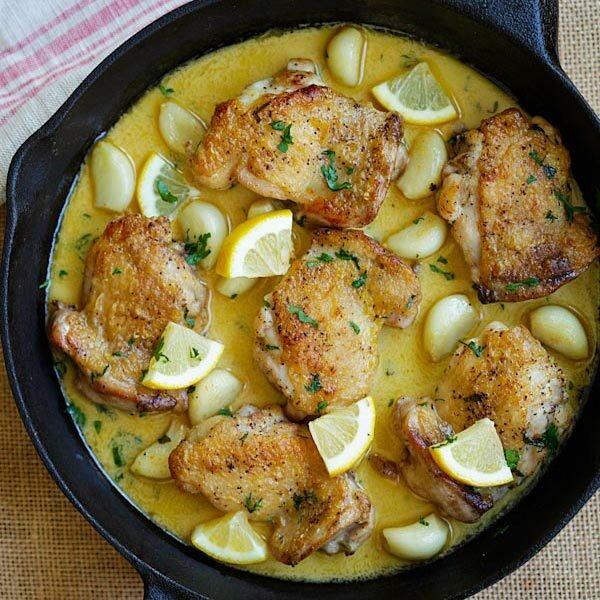 Creamy Lemon Garlic Chicken – crazy delicious skillet chicken with creamy lemon garlic sauce. S0 easy and dinner is ready in 20 mins. Creamy garlic chicken is one of the most popular chicken recipes on my blog. The reason is simple; it’s a one-pan (one-skillet) dish, and everyone loves chicken with a creamy garlicky sauce. It’s also one of my son’s favorite dishes. He loves the creamy garlic chicken with Parmesan garlic noodles. 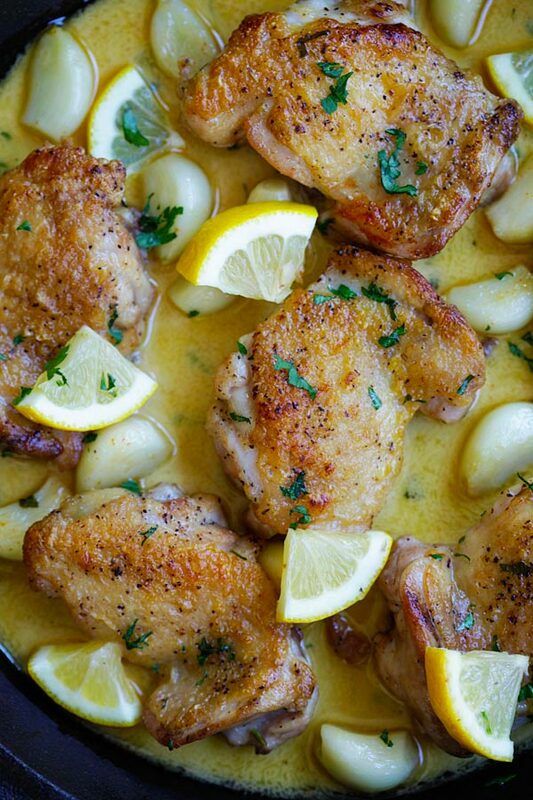 This creamy lemon garlic chicken is quickly becoming his new favorite because it’s even better and more delicious. 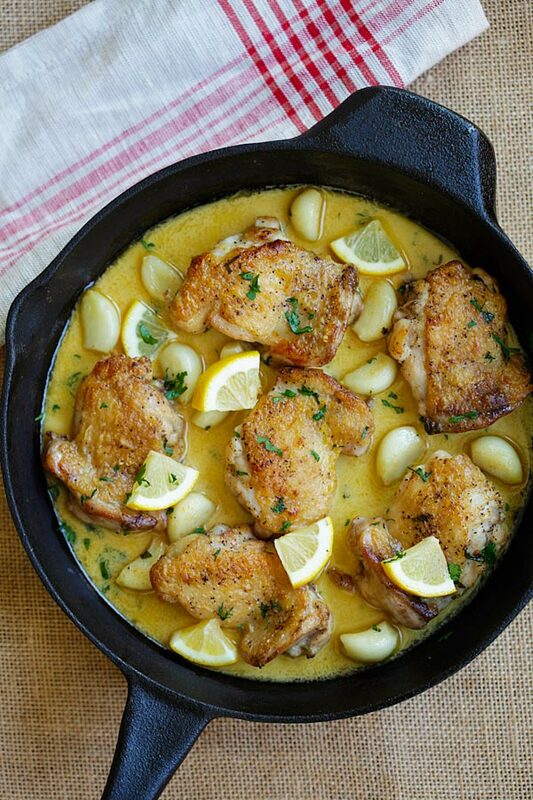 The perfect balance of the different flavors: lemon, garlic, chicken broth, white wine and whipping cream make it an utterly mouthwatering dish that goes well with pasta, rice, or noodles. It’s no wonder little G always asks me for the dish. For the chicken, you can use chicken breasts (boneless and skinless for healthier result) or chicken thighs. You know me, little G loves chicken skin but dislikes chicken breasts. So I always buy skin-on and bone-in chicken thighs, but I debone the chicken thighs at home (learn and watch the video on how to debone chicken thighs). It’s just easier for little G to eat. Removing the bones also allow me to pan-fry the meat part of the chicken thighs to golden brown and crispy perfection. All these small things really make a huge difference to the end result of this recipe. For flavorings, I like to mix Asian ingredients with western cooking. I used Japanese cooking sake and mirin to flavor the creamy lemon garlic sauce. However, if you don’t have them, it’s totally fine. 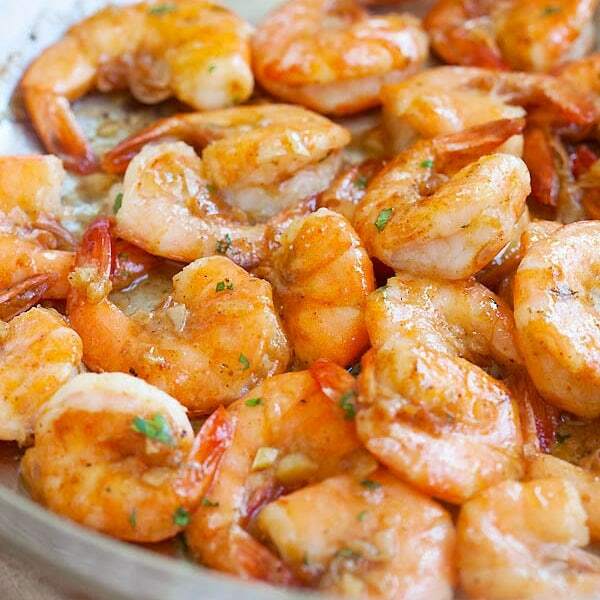 You can use white wine and sugar to balance the flavors. 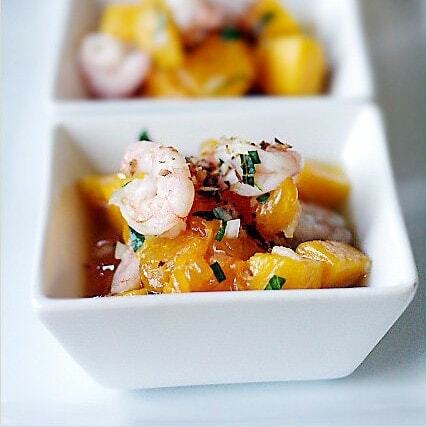 If you can’t consume alcohol, skip entirely and it will be equally flavorful. 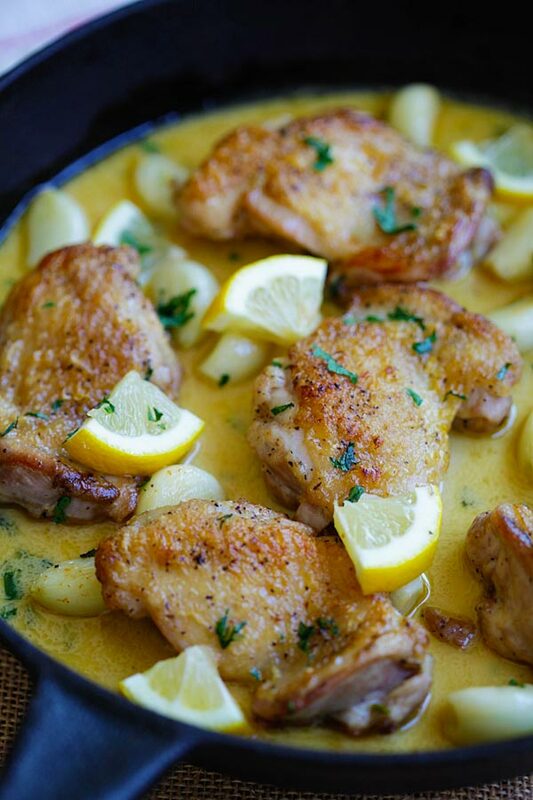 Creamy Lemon Garlic Chicken – crazy delicious skillet chicken with creamy lemon garlic sauce. 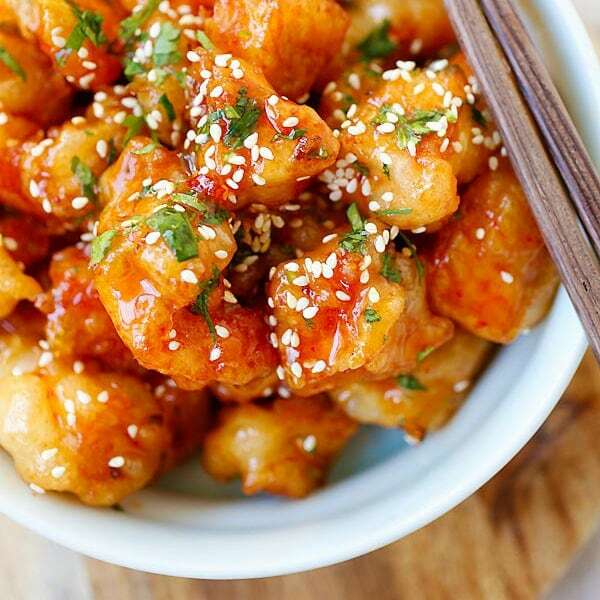 So easy and dinner is ready in 20 mins. Debone the chicken thighs but keep the skin on. Click here to see the video on how to debone chicken thighs. Season the chicken with salt and black pepper, on the both surfaces. 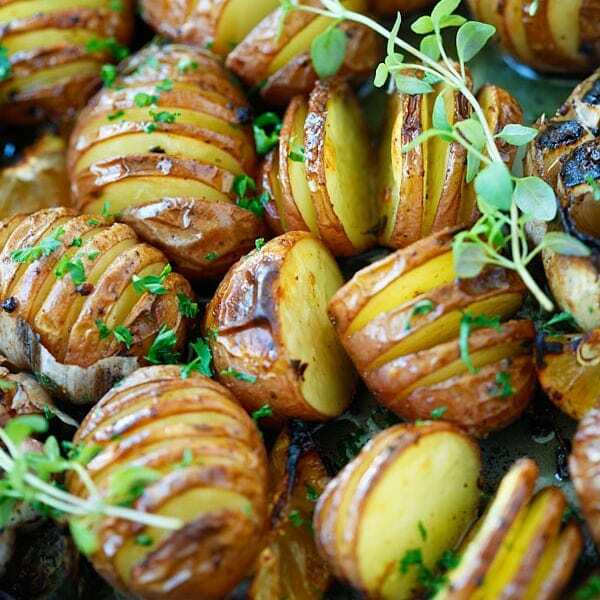 Heat up a skillet (cast-iron skillet preferred) on medium heat, add 1 tablespoon of olive oil. Pan-fry the chicken until both surfaces become crispy or nicely browned. Remove the chicken from the skillet and set aside. Add the remaining olive oil and saute the garlic until slightly browned, follow by the chicken broth, whipping cream, lemon slices, cayenne pepper, white wine, mirin (if using), salt and sugar. Lower the heat and let simmer. Add the chicken back into the skillet. Reduce the sauce a little bit more. Add parsley, stir well, remove from heat and serve immediately. You can use chicken breasts or bone-in chicken thighs. All photos and recipes on Rasa Malaysia are copyright protected. Please do not use the photos and recipes without prior written permission. 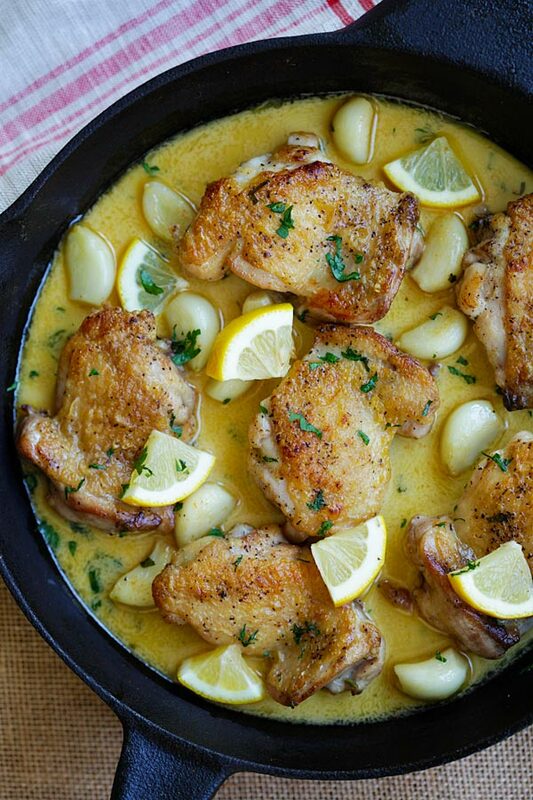 If you wish to republish this recipe, please rewrite the recipe in your own words instead of copy and paste and link back to //rasamalaysia.com/creamy-lemon-garlic-chicken/. Thank you very much! Made this tonight, it was so yummy! Didn’t have wine, so subbed with apple juice. And for fun, added 1/2 T of butter at the end. Thanks for a great recipe! I tried this last night for my family of four. My husband and girls (4 and 5 years old) loved it and practically licked their plates! I used 1 lb of sliced chicken breast and paired it with angel hair pasta, I also omitted the wine. I will definitely be using this recipe again and again! Thanks! 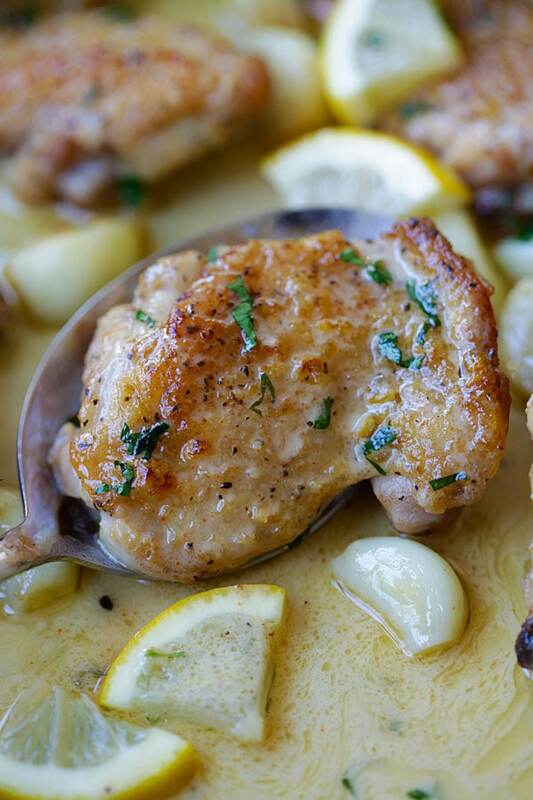 Sheena – thanks for loving my creamy lemon garlic chicken recipe. 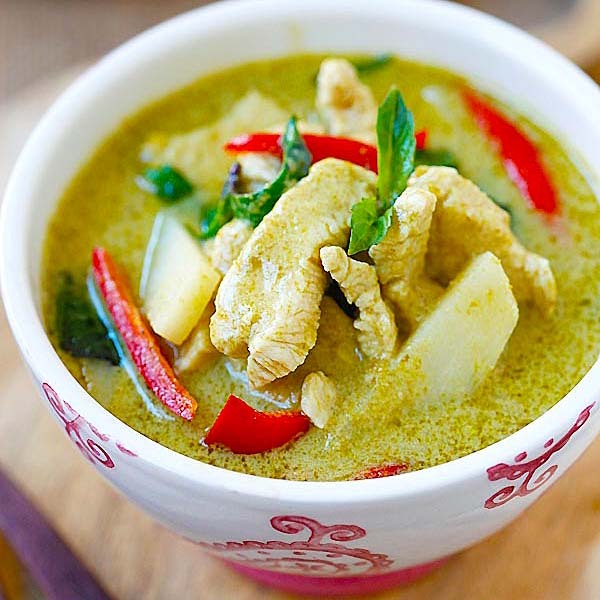 You should try the creamy garlic chicken, too! Tried the recipe tonight loved the flavor. I used 900g chicken thigh with skin, already debone ( in sydney many asian butchery will sell it like this), which was 3 big thigh pieces which I cut into total 9 smaller pieces ( each piece is about 4 bite sized)- good size because it cooked faster and had more sauce coverage. Would not recommend too large pieces because it can taste bland. I used 15 cloves of garlic , bought pre peeled ones from local asian grocery , unfortunately it was still surprisingly ungarlicy! I might need to peel my own and maybe squash them a little bit and hopefully it will have more garlic aroma and taste. I used japanese cooking sake and mirin and tasted good . Used whipping cream ( for those in sydney these have minimum 35% milk fat content ) which worked great. Not too creamy or runny. Used half of a regular sized Aussie lemon , initially I tried the sauce and thought it was slightly too sour – but once I paired it with angel pasta it was perfect ! However for those unsure maybe start with 1/3 lemon then add more . Used those partially dried parsley and do think fresh would be even nicer. 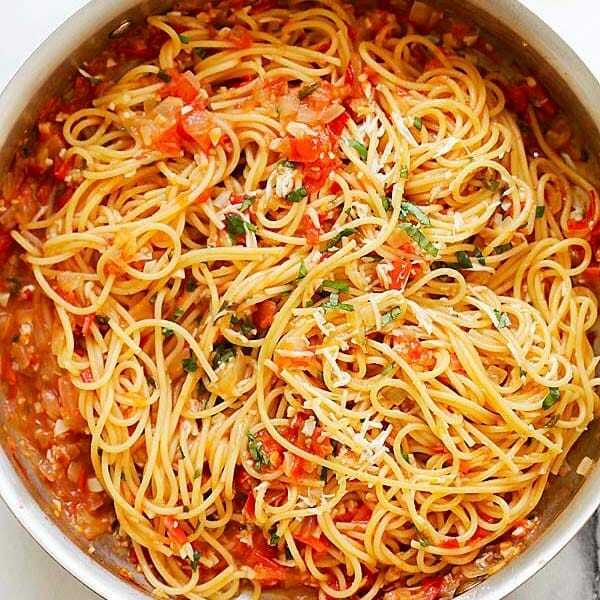 Don’t skip the cayenne pepper – I used only a few sprinkles because I don’t like chilli, but it added great dimension almost like a non spicy kick. Great recipe and the proportions worked. I only added a little bit more liquid ( 1 cup chicken stock and a splash more whipping cream), since the recipe is 1.5 lb which is only 700g and I had 900g chicken. It was enough for 2 meals for 2 people. I think I might add some oyster or shimeji mushroom ( think it goes better than button mushroom) so I can skip vegie sides separately. Also if you blanch some baby spinach also easy to complete the meal. Can’t wait to use this recipe base again, funnily I want to add pumpkin pieces to it because it just seems it will go! Made this tonight with chicken breasts and it was just delicious!!! Everyone loved it and can’t wait to make again! Thanks!!! Hi there :) This looks delicious! 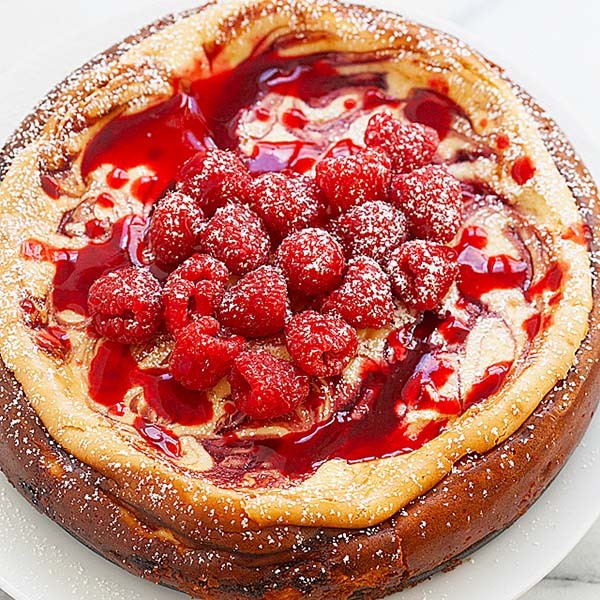 Is there another way of making this without the cream? Thanks! Yes you can just leave the cream out or use yoghurt. Thinking about making this recipe but don’t have whipping cream on hand. Can I substitute with milk or coconut milk or what else would you suggest? You can use milk but not coconut milk.